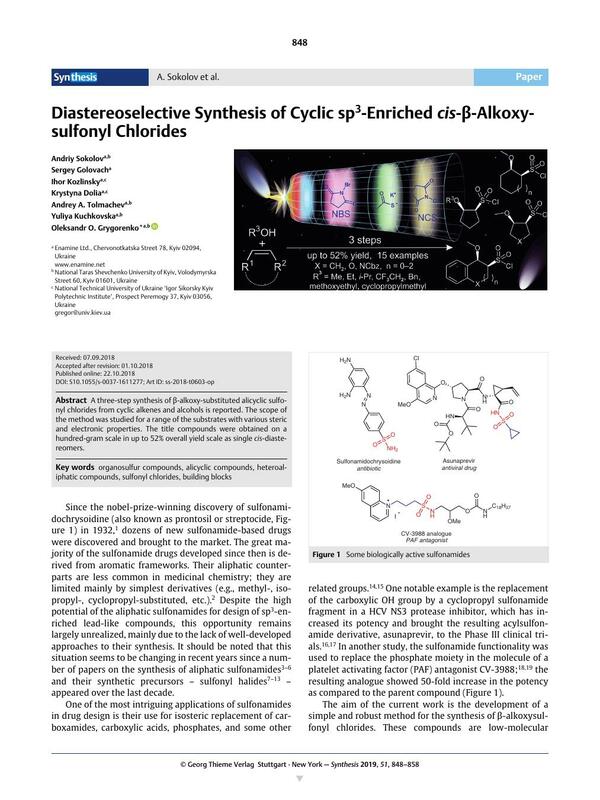 › Author AffiliationsThis work was funded by Enamine Ltd.
A three-step synthesis of β-alkoxy-substituted alicyclic sulfonyl chlorides from cyclic alkenes and alcohols is reported. The scope of the method was studied for a range of the substrates with various steric and electronic properties. The title compounds were obtained on a hundred-gram scale in up to 52% overall yield scale as single cis-diastereomers. Supporting information for this article is available online at https://doi.org/10.1055/s-0037-1611277. 2 According to ChEMBL database from march 2018; https://www.ebi.ac.uk/chembl. 31 Armarego WL. F, Chai C. Purification of Laboratory Chemicals . Elsevier; Oxford: 2003. 5th ed.